USS Wisconsin, Fourth Divisional Flagship, Great White Fleet (1901). USS Wisconsin (BB-9), an Illinois-class battleship, was the first ship of the United States Navy to be named for the 30th state. The keel of Battleship No. 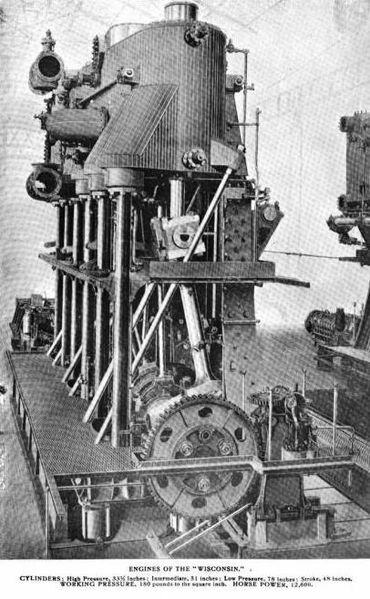 9 was laid down on February 9th, 1897 at San Francisco, California, by the Union Iron Works. She was launched on November 26th, 1898, sponsored by Miss Elizabeth Stephenson, the daughter of Senator Isaac Stephenson of Marinette, Wisconsin, and commissioned on February 1901, Captain George C. Reiter in command. 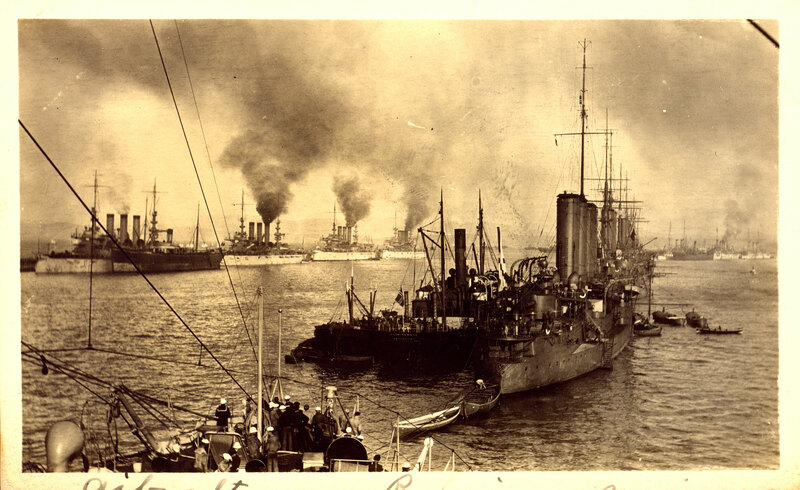 Departing San Francisco on March 12th, 1901, Wisconsin conducted general drills and exercises at Magdalena Bay, Mexico from March 17th – April 11th, before she returned to San Francisco on April 15th to be drydocked for repairs. Upon completion of that work, Wisconsin headed north along the Western seaboard, departing San Francisco on May 28th and reaching Port Orchard, Washington on June 1st. She remained there for nine days before heading back toward San Francisco. She next made a voyage in company with Oregon, Iowa, Philadelphia, and Farragut to the Pacific Northwest, reaching Port Angeles, Washington on June 29th. She then shifted to Port Whatcom, Washington on July 2nd, and participated in July 4th observances there before she returned to Port Angeles the following day to resume her scheduled drills and exercises. Those evolutions kept the ship occupied through mid-July. Following repairs and alterations at the Puget Sound Navy Yard in Bremerton, Washington from July 23rd – October 14th, Wisconsin sailed for the middle and southern reaches of the Pacific, reaching Honolulu, Hawaii on October 23rd. After coaling there, the battleship then got underway for Samoa on October 26th and exercised her main and secondary batteries en route to her destination. Reaching the naval station at Tutuila on November 5th, Wisconsin remained in that vicinity – along with Abarenda and Solace – for a little over two weeks. Shifting to Apia, the scene of the disastrous hurricane of 1888, Wisconsin hosted the Governor of German Samoa before the man-of-war departed that port on November 21st, bound for the coastal waters of Central and South America via Hawaii. Wisconsin reached Acapulco, Mexico, on Christmas Day 1901, and remained in port for three days. 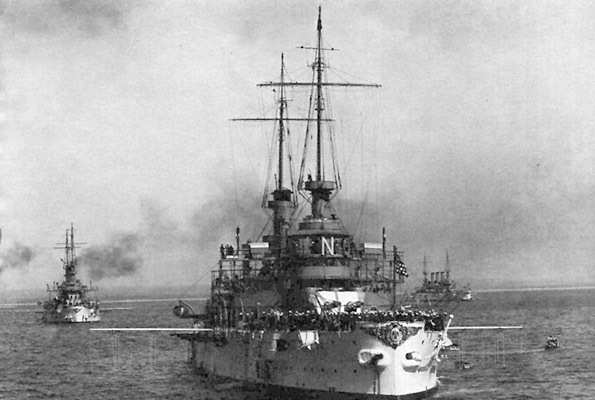 After coaling, the man-of-war twice visited Callao, Peru, and also called at Valparaiso, Chile, before she returned to Acapulco on February 1902. Wisconsin exercised in Mexican waters at Pichilinque Bay and Magdalena Bay from March 6th-22nd, carrying out an intensive and varied slate of exercises that included small-arms drills, day and night main battery target practices, and landing force maneuvers. She conducted further drills of various kinds as she proveeded up the west coast, touching at Coronado, California, San Francisco, and Port Angeles before she reached the Puget Sound Navy Yard on June 4th. This battleship underwent repairs and alterations until August 11th. She then conducted gunnery exercises off Tacoma, Washington, and Seattle, Washington, before she returned to the Puget Sound Navy Yard on August 29th for further work. She remained there until September 12th, when she sailed for San Francisco, en route to Panama. Her task completed, the battleship departed Panama’s waters on November 22nd and arrived at San Francisco on December 6th to prepare for gunnery exercises. Four days later, Rear Admiral Casey shifted his flag to New York, thus releasing Wisconsin from flagship duty for the Pacific Squadron. The battleship consequently carried out her firings until December 17th, when she sailed for Bremerton. Reaching the Puget Sound Navy Yard five days before December 25th, Wisconsin then underwent repairs and alterations until May 19th, 1903, when she sailed for the Asiatic Station. Proceeding via Honolulu, Wisconsin arrived at Yokohama, Japan on June 12th, with Rear Admiral Yates Stirling embarked. Three days later, Rear Admiral Stirling exchanged flagships with Rear Admiral P.H. 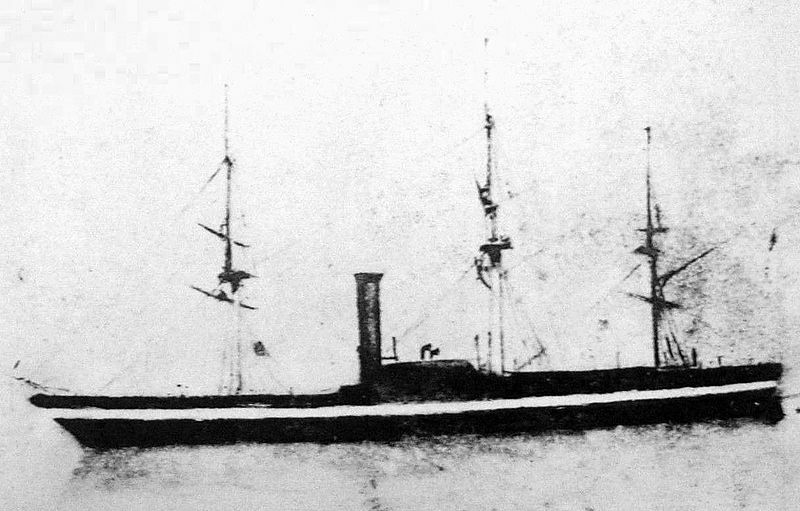 Cooper who broke his two-starred flag at Wisconsin’s main as Commander of the Asiatic Fleet’s Northern Squadron while Admiral Stirling hoisted his in the tender Rainbow. Wisconsin operated in the Far East, with the Asiatic Fleet, over the next three years before she returned to the United States in the autumn of 1906. She followed a normal routine of operations in the northern latitudes of the station – China and Japan – in the summer monthes, because of the oppressive heat of the Philippine Islands that time of the year, but in the Philippine Archipelago in the winter. She touched at ports in Japan and China including Kobe, Yokohama, Nagasaki, and Yokosuka; Amoy, Shanghai, Chefoo, Nanking, and Taku. In addition, she cruised the Yangtze River as far as Nanking, the Inland Sea, and Nimrod Sound. The battleship conducted assigned fleet maneuvers and exercises off the Chinese and Philippine coasts intervening those evolutions with regular periods of in-port upkeep and repairs. During that time, she served as Asiatic Fleet flagship, wearing the flag of Rear Admiral Cooper. The battleship departed Yokohama on September 20th, and after calling at Honolulu en route from October 3rd-8th, arrived at San Francisco on October 18th. After seven days stay at that port, she headed up the west coast and reached the Puget Sound Navy Yard on October 28th. She was decommissioned there on November 16th, 1906. Recommissioned on April 1st, 1908, Captain Henry Morrell in command, Wisconsin was fitted out at the Puget Sound Navy Yard until the end of April. 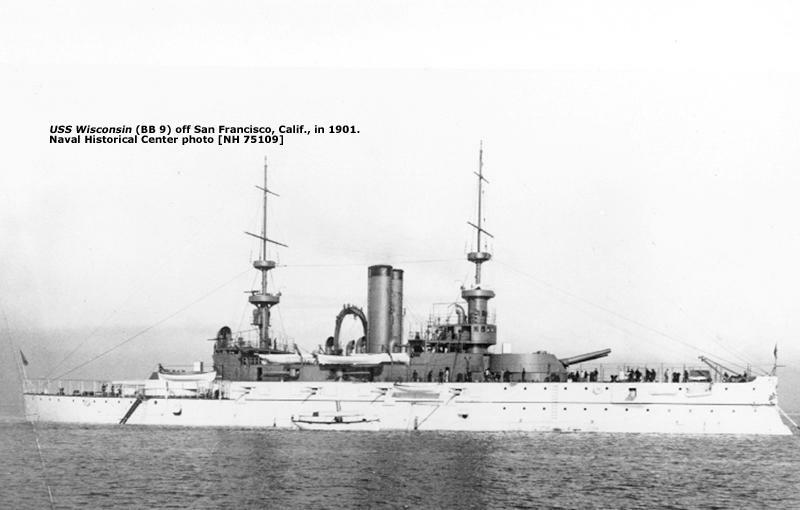 After shifting to Port Angeles from April 30th – May 2nd, the battleship proceeded down the western seaboard and reached Sand Francisco on May 6th to participate in a fleet review at that port. She subsequently returned to Puget Sound to complete the installation of her fire control equipment from May 21st – June 22nd. Soon thereafter, Wisconsin retraced her southward course, returning to San Francisco in early July. There, she joined the battleships of the Atlantic Fleet in setting out on the transpacific leg of the momentous circumnavigation of the globe. The cruise of the “Great White Fleet” served as a pointed reminder to Japan of the power of the United States – a dramatic gesture made by President Theodore Roosevelt as a signal evidence of his “big stick” policy. 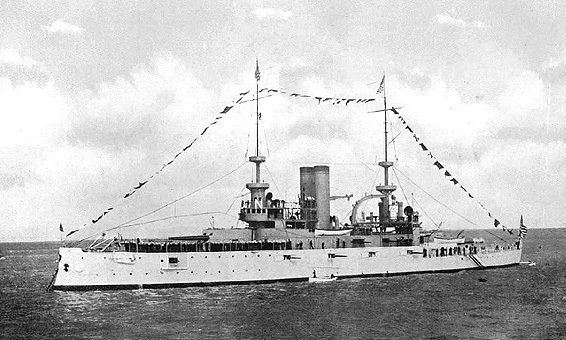 Wisconsin, during the course of her part of the voyage, called at ports in New Zealand, Austrailia, the Philippines, Japan, China, Ceylon, and Egypt; transited the Suez Canal; visited Malta, Algiers, and Gibraltar before arriving in Hampton Roads on Washington’s Birthday 1909, and passing in review there before President Roosevelt. The epic voyage had confounded the doom-sayers and critics, having been accomploshed without any serious incidents or mishaps. Wisconsin departed from the Tidewater area on March 6th and arrived at the Portmouth Navy Yard in Kittery, Maine three days later. The pre-dreadnought battleship there underwent repairs and alterations until June 23rd, doffing her bright “white and spar color” and donning a more business like gray. The man-of-war joined the Atlantic Fleet in Hampton Roads at the end of June, but she remained in those waters only a short time before she sailed north to Portland, Maine, arriving there on July 2nd in time to take part in the Fourth of July festivities in that port. The battleship next headed down the eastern seaboard, cruising off Rockport, Massachusetts and Provincetown, Massachusetts before she returned, with the fleet, to Hampton Roads on August 6th. Over the ensuing weeks, Wisconsin fired target practices in the southern drill grounds, off the Virginia capes, breaking those underway periods with upkeep in Hampton Roads. Wisconsin steamed with the fleet to New York City where she anchored in the North River to take part the Hudson-Fulton Celebration from September 22nd – October 5th before she underwent repairs at the Portsmouth Navy Yard from October 7th – November 28th. She then dropped down to Newport, Rhode Island, upon the conclusion of that years period, picking up drafts of men for transportation to the Atlantic Fleet at Hampton Roads. Wisconsin operated with the fleet off the Virginia capes through mid-December, before she headed for New York for the Christmas holidays in port. 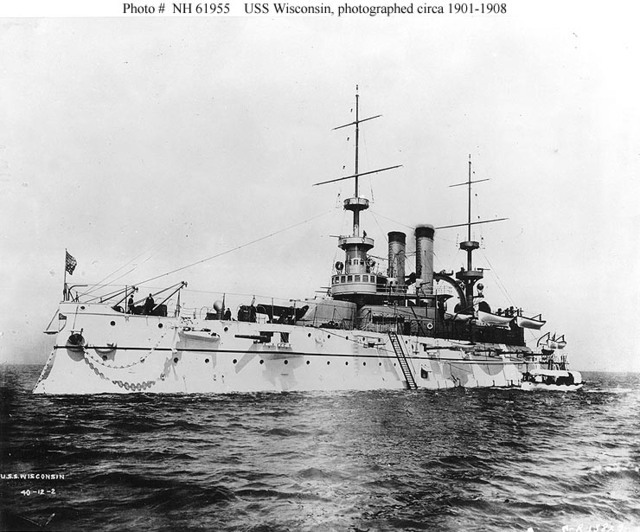 Subsequently cruising to Cuban waters in early January 1910, the battleship operated out of Guantanamo Bay Naval Base from January 12th – March 19. 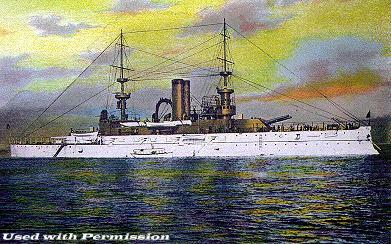 The pre-dreadnought battleship then visited Tomkinsville, New York, and New Orleans, Louisiana, before she discharged ammunition at New York City on April 22nd. Later that spring, 1910, she moved to the Portsmouth Navy Yard, where she was placed in reserve. She was moved to Philadelphia, Pennsylvania in April 1912 and, that autumn, took part in a naval review off Yonkers, New York, before resuming her reserve status until Atlantic Reserve Fleet. 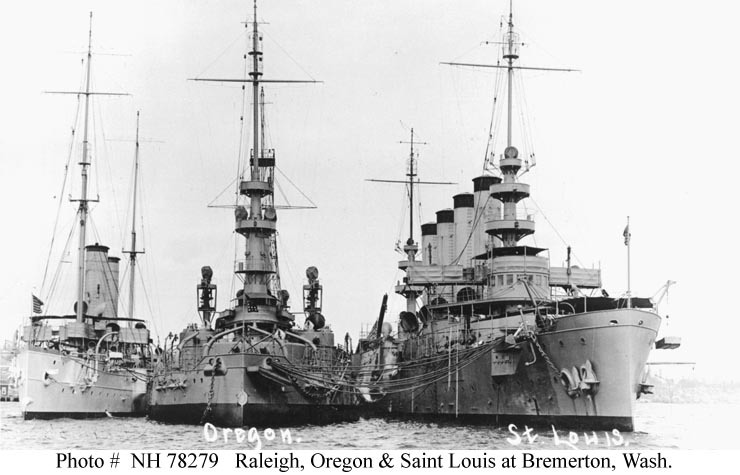 Placed “in ordinary” on October 1913, Wisconsin remained in that status until she joined the United States Naval Academy Practice Squadron the spring of 1915 assuming training duties along with Missouri and Ohio. With that group, she become the third battleship to transit the Panama Canal, making that trip mid-July 1915 en route to the west coast of the United States with her embarked officers-to-be. 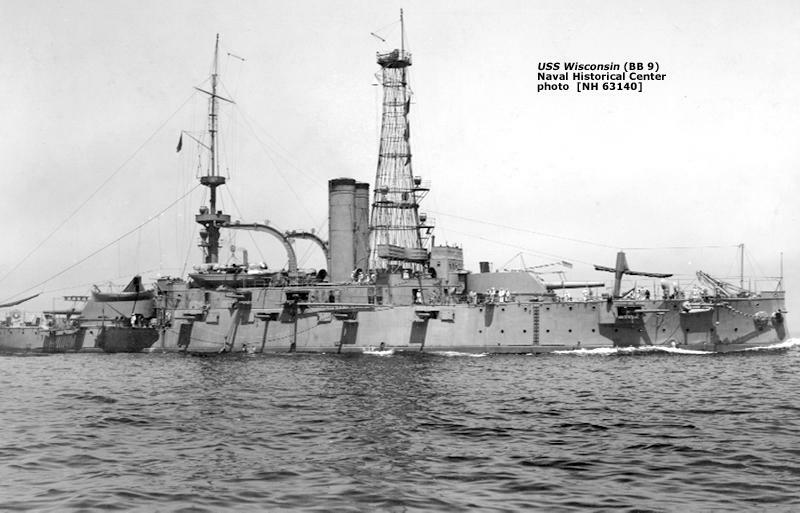 Wisconsin discharged her duties as a midshipman’s training ship into 1917 and was moored at the Philadelphia Navy Yard on April 6th of that year when she received word that the United States had declared war on Germany. 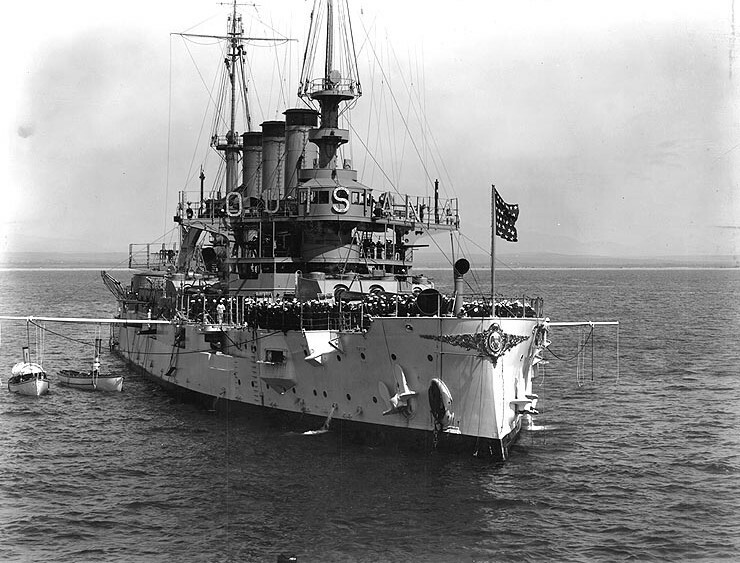 Two days later, members of the Naval Militia began reporting on baord the battleship for quarter and subsistence. 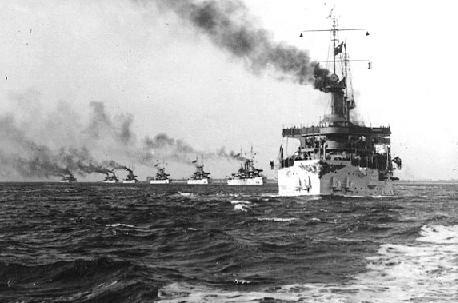 On April 23rd, Wisconsin, Missouri, and Ohio were placed in full commissioned and assigned to the Coast Battleship Patrol Squadron. On May 2nd, Commander David F. Sellers reported onboard and took command. Four days later, the battleship got underway for the Virginia capes; and she arrived at Yorktown, Virginia on May 7th. 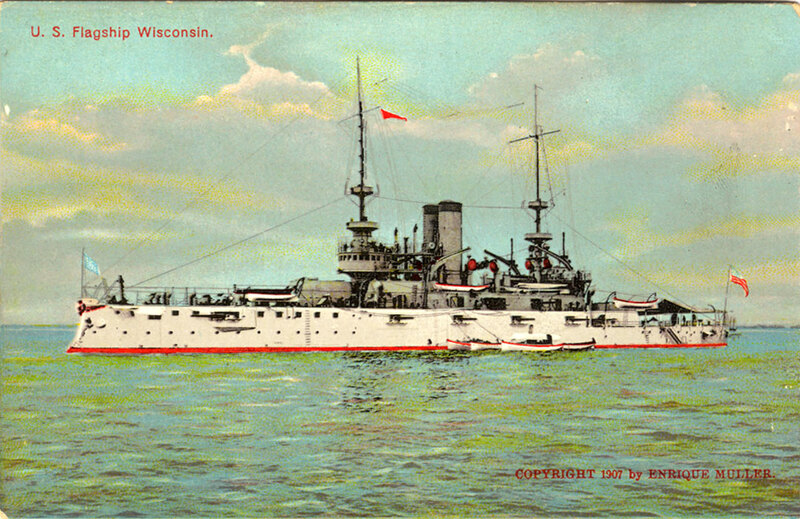 From early May-early August, Wisconsin operated as an engineering school ship on training cruises in the Chesapeake Bay-York River area. 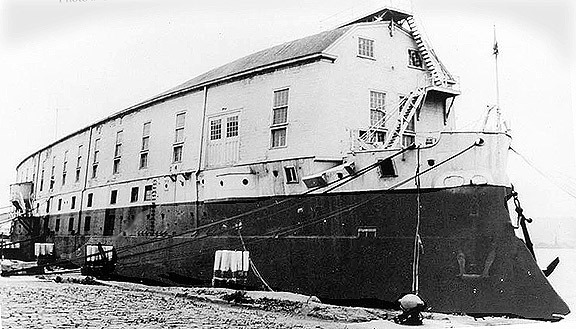 She trained recruits as oilers, watertenders, and firemen, who, when qualified, were assigned to the formerly interned merchantmen of the enemy taken over by the United States upon the declaration of war, as well as to submarine chasers and the merchant vessels then building in American yards. Wisconsin then maneuvered and exercised in company with Kearsarge, Alabama, Illinois, Kentucky, Ohio, Missouri, and Maine from August 13-19, en route to Port Jefferson, New York. Over the ensuring weeks, Wisconsin continued training and tactical maneuvers based on Port Jefferson, making various training cruises into Long island Sound. She subsequently returned to the York River region early in October and resumed her training activities in that locale, operating primarily in the Chesapeake Bay area. 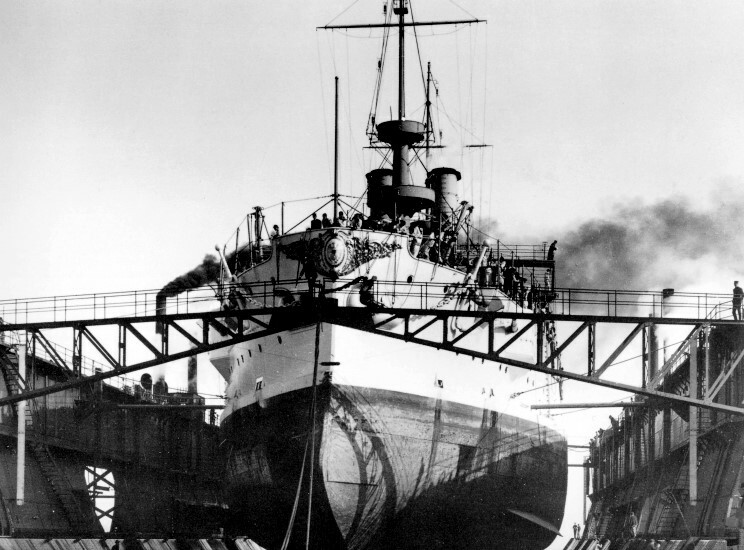 Wisconsin continued that duty into the spring of 1918, interrupting her training evolutions from October 30th – December 18 for repairs at the Philadelphia Navy Yard. After another stint of repairs at Philadelphia from May 13-June 3rd, 1918, Wisconsin got underway for a cruise to Annapolis, Maryland, but after passing the Brandywine Shoal Light, received orders to stick close to shore. Those orders were later modified to send Wisconsin up the Delaware River as far as Bombay Hook, since an enemy submarine was active off Cape Henlopen. Postwar examination of German records would show that U-151, the first of six enemy submarines to come to the eastern seaboard in 1918, sank three schooners on May 23rd and other ships over ensuing days. Getting underway again on June 6th, Wisconsin arrived at Annapolis on the following day. One the next day, the battleship embarked 176 third-class midshipmen and got underway for the York River. the ship conducted training evolutions in the Chesapeake Bay region until August 29th, when she returned to Annapolis and disembarked midshipmen. Underway for Yorktown on August 30th, Wisconsin there embarked 217 men for training as firemen, water tenders, engineers, steersmen and signalmen, resumed her training duties, and continued the task through the signing of the armistice. Wisconsin completed her training activities on December 20th, sailed north, and reached New York City three days before Christmas. Wisconsin was among the ships reviewed by Secretary of the Navy Josephus Daniels from Mayflower and by Assistant of the Navy Franklin Delanto Roosevelt from Aztec on December 26th. Wisconsin cruised with the fleet in Cuban waters that winter, and in the summer of 1919 made a midshipman training cruise to the Caribbean. Placed out of commission on May 15th, 1920, Wisconsin was reclassified BB-9 on July 17th, while awaiting disposition. She was sold for scrap on January 26th, 1922 as a result of the Washington Naval Treaty. 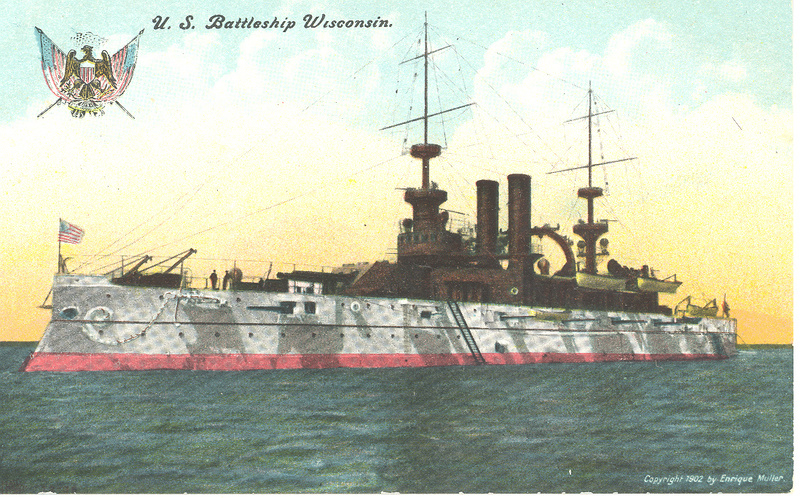 Wisconsin was part of the “Great White Fleet”. Rear Admiral Robley D. Evans, 1901. Robley Evans was the gruff captain commanding the USS Iowa, the U.S.’s largest and newest battleship, at the Battle of Santiago. Robley Dunglison Evans (18 August 1846-3 January 1912) was born in Floyd County, Virginia. At theoutbreak of the Civil War, he was a student at the U.S. Naval Academy at Annapolis,graduating in 1863 and beginning his active service with the U.S. fleet. He served in the United States Navy from the American Civil War to the Spanish-American War, attaining the rank of rear admiral. In 1907-1908 he commanded the Great White Fleet on its worldwide cruise from the Atlantic Ocean through the Straits of Magellan to the Pacific Ocean. In 1859 Utah Territory delegate William Henry Hooper offered Evans the territory’s nomination to the United States Naval Academy. After establishing residency in Utah, he entered the academy in 1860. Evans was ordered to active duty in September 1863 and graduated from the academy in the class of 1864. Late in the American Civil War, on the 15th of January, 1865, at 10:40 A.M., a party consisting of 100 seamen and marines left the USS POWHATAN in company with detachments from other ships of the fleet to attack Fort Fisher, North Carolina, held by the Confederates. The men in the naval landing force were all volunteers. Among them was Ensign Robley D. Evans and private Henry Wasmuth. As he proceeded toward the fort, Evans was shot in the thigh. Not letting the painful wound deter him, he wrapped a handkerchief around it and led his men toward the Fort. In a short span, he was shot several more times. Ensign Robley D. Evans fell wounded from a Confederate sharpshooter’s bullet to the knee. Private Wasmuth picked up the seriously wounded young officer and carried him to a place of comparative safety-—a shell hole on the beach. The private stayed with Ensign Robley D. Evans (the future admiral), ignoring the latter’s urgings to take cover, until a sharpshooter’s bullet pierced Wasmuth’s neck, cutting the jugular vein. Within a few minutes, Wasmuth dropped in the edge of the surf and died (Evans later wrote: “He was an honor to his uniform”). As the battle continued, and while under severe fire from the fort, Evans and other wounded men were rescued by a detachment from the U.S.S. PEQUOT, led by Acting Ensign Anthony Smalley . The wounded were taken to the U.S.S. NEREUS, then transferred to the SANTIAGO DE CUBA for passage to the hospital at Norfolk. Because of his serious wounds, as he lay helpless in the hospital, he was approached by a surgeon who suggested amputation. Evans pulled out a pistol from under his pillow and said he would shoot at the first sign of a surgeon’s saw. The surgeon concluded that Evans would die, and did not press for amputation. Obviously, the young ensign survived. However, these injuries left him with a limp and severe pain for the rest of hislife. Because of this limp, later in his life, while in command of the Great White Fleet in 1907, he was affectionately known as “ Gimpy Evans” by the crews of the ships under his command. After the Civil War, because of his injuries, he was medically retired from the U.S. Navy. After many years, and after appealing to Congress for reinstatement, he was again placed into active duty in the Navy. Evans held numerous important sea commands during the 1890s. In 1891 and 1892, commanding Yorktown on the Pacific Squadron, he won great acclaim for his firm and skillful handling of a tense situation with Chile, becoming known as “Fighting Bob” Evans. Though he evidently took pride in his nickname, his reputation for profanity also led to his being chastised by Leonard Woolsey Bacon, pastor of the Congregational Church in Litchfield, Connecticut, in a letter to The New York Times. After the departure of the USS Baltimore, the interests of the United States were guarded by the USS Yorktown under Evans, a determined and forceful man. He attempted to heal the differences by showing courtesy to the people of Chile. However, according to his writings, his crew members and himself were subjected to insults from the people of Chile. Evans advised the Chilean officials that he believed that they were incapable of maintaining order on the streets. He suggested that he would arm his crewmen when they were required to go ashore, and have them shoot anyone that threatened them or insulted them. Evans was getting irritated with the situation and began to become nasty, which was not difficult for him to do. use in the harbor. In so doing, they came very close to the YORKTOWN, seemingly to intimidate the Americans. Evans protested. The president of Chile replied that the Chilean ships could travel wherever they desired in Chilean waters. At this, Evans stated that the YORKTOWN was the property of the United States government, and if the paint of the ship was so much as scratched, he would sink the offending torpedo boat. As the two nations argued over the events surrounding the USS Baltimore’s crew, the threat of war became a strong probability. Robley Evans received a message ordering him to keep his ship full of coal, which led him to wonder, “they regarded me at the [Navy] Department as some kind of idiot. Of course I [as commander of the YORKTOWN] was full of coal and everything else I should need when the time foraction came”. On January 23, 1892, the Chilean government sent a message to President Harrison expressing a willingness to pay reparations for the dead and injured sailors. This led to a cessation of hostile actions and the incident was concluded. Because of his strong stand against the Chileans, Robley Evans was nicknamed ”Fighting Bob Evans.” Evans later commented that this nickname seemed odd, since, by his actions, he managed to skillfully avoid a fight. Evans, because of hisforthright, if gruff, manner had won the grudging respect of the Chileans. 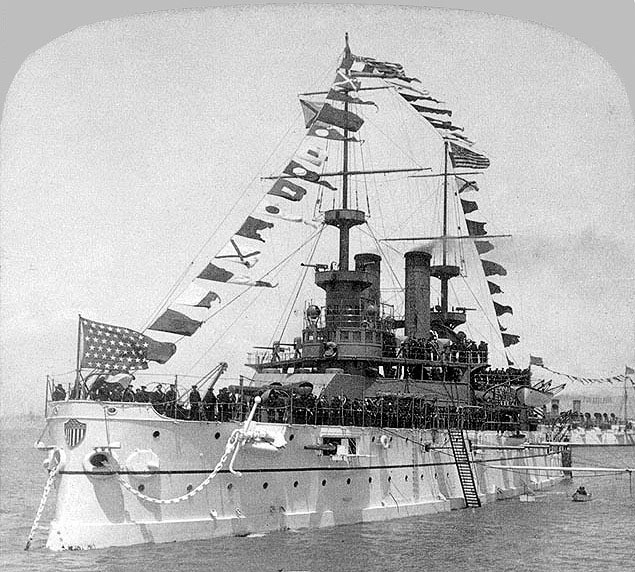 The United States’ first sea going battleship, USS Indiana (BB-1) was placed in commission 20 November 1895, with Captain Evans in command. Former President Benjamin Harrison with a committee from the state of Indiana presented a set of silver to Evans for the battleship on 16 September 1896 at Tompkinsville, New York. 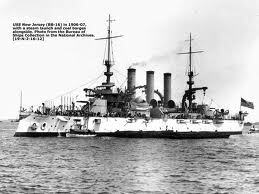 During the Spanish-American War he commanded the battleship USS Iowa (BB-4) in the Battle of Santiago de Cuba. When the Spanish American War began, Captain Robley D. Evans found himself in command of the U.S.’s newest and largest battleship, the USS Iowa. She had only been commissioned less than a year earlier. On May 12, 1898, the USS Iowa with Evans in command, joined the other ships of the squadron and entered the firing line against the Morro Battery and theEastern Battery at San Juan de Puerto Rico. After firing on the Spanish batteries forabout two hours, the fleet discontinued action. During the course of this event, the USS Iowa was struck by ashell from the Eastern Battery, which wounded three men and caused some damage on deck. As the engagement continued, the Spanish torpedo boat destroyers Furor and Pluton approached and were also fired on by the USS Iowa. With fire from the USS Iowa, USS Indiana, USS Gloucester, and other vessels of the squadron, the Furor and Pluton were sunk. 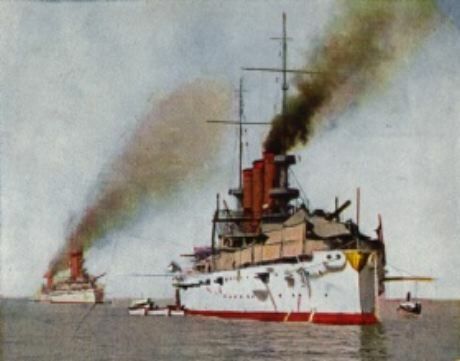 The Oquendo and Maria Teresa were both on fire and sunk by the guns of other American ships. 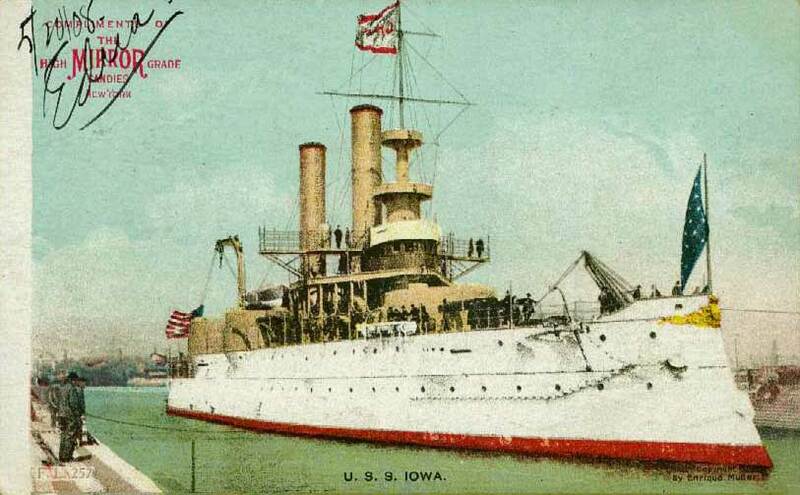 The USS Iowa continued firing on the Vizcaya until she struck her colors and had run aground. With other ships of the fleet involved in the pursuit of the escaping Cristobal Colon, Evans chose to goto the aid of the crew of the Vizcaya. The Spanish crewmen, while trying to escape the burning vessel and climb onto the beach, were being attacked by the Cubans.Evans was incensed bythis attack on defenseless men who had fought to the best of their ability. Lowering boats, a landing party was sent ashore to defend the Spaniards against the Cubans. 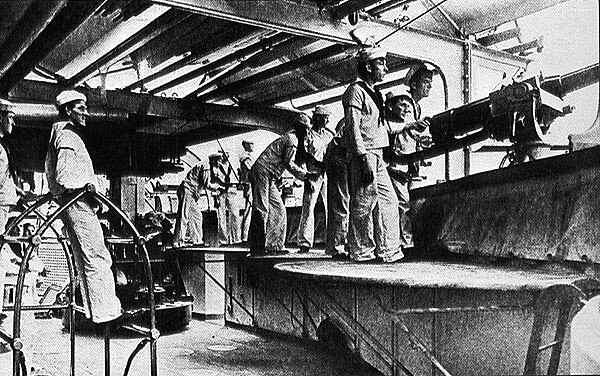 An officer was sent to find the Cuban commander and inform him that “unless they ceased their infamous work,” Evans would turn the immense guns of the USS Iowa on the Cubans themselves. Lt. Cmdr. Wainwright of the Gloucester similarly threatened the Cubans. The combination of forces caused the Cubans to cease their action. The USS Iowa’s crew rescued Captain Eulate, the commanding officer of the Vizcaya,along with 23 officers and about 248 men of the Spanish crew. Five dead of the Spanish crew were buried with honors, the wounded were cared for, and the remaining became prisoners of war. As he always did, Captain Evans included complimentary statements in his reports pertaining to his “admiration for his magnificent crew”. The USS Iowa had suffered no losses to the crew in the action, something that would have extra meaning to Evans. Serving under him aboard the USS Iowa was his son, a naval cadet. Robley Dunglison Evans was named president of the Board of Inspection and Survey from February 1901 to April 1902. President Theodore Roosevelt selected Admiral Robley D. Evans to host His Royal Highness Heinrich of Prussia brother of Germany’s Kaiser Wilhelm II. 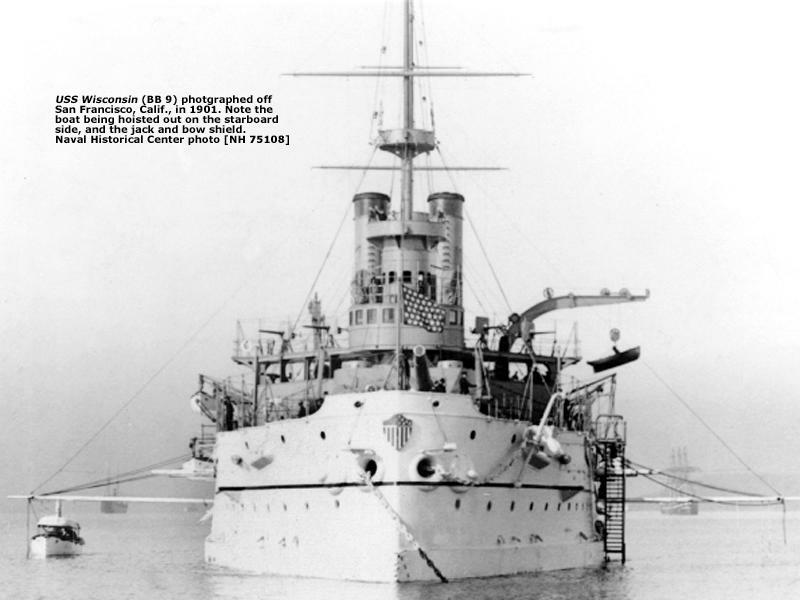 15 February 1902 Admiral Evans, as Commander-in-Chief of a special honor squadron hoisted his flag on the battleship, USS Illinois (BB-7) at the New York Navy Yard. Evans feted Prince Henry during the visit of the Kaiserliche Marine Imperial German Navy. After the departure of the German prince, 28 February 1902, Evans flag was hauled down on Illinois. Admiral Evans transferred his flag from armored cruiser, USS New York (ACR-2) on 4 November 1902 to battleship, USS Kentucky (BB-6) at Yokohama, Japan. 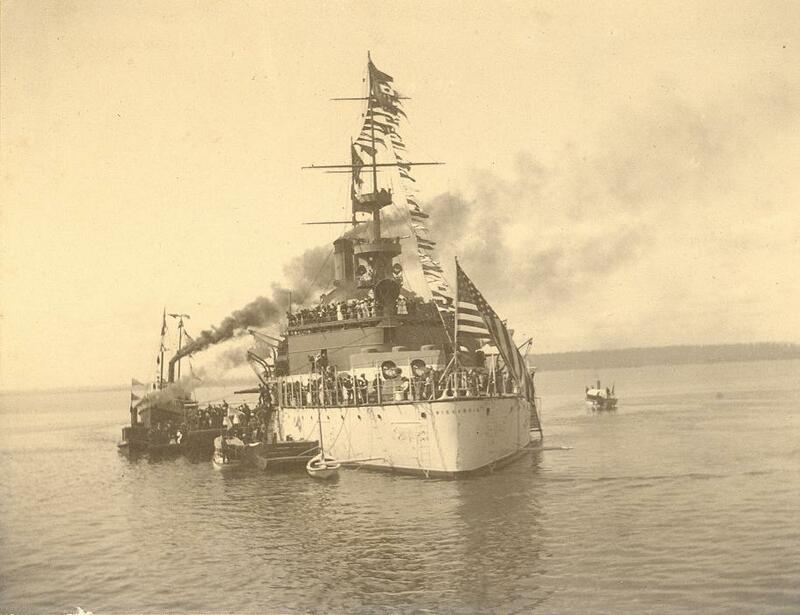 5 December 1903 the Kentucky left Japanese waters for Hawaii. 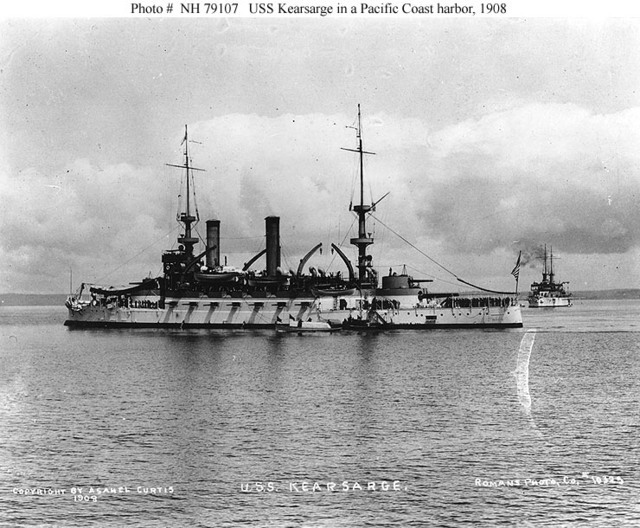 16 December 1903, the Kentucky arrived at Pearl Harbor Naval Station, Hawaii. Admiral Evans hosted a Christmas dinner for the officers of Kentucky at the Moana Hotel in Waikiki. Evans flagship departed Honolulu for Guam. Kentucky arrived in Cavite, Philippines on 18 January 1904. Admiral Evans called on the new Governor-General of the Philippines, Luke Edward Wright at the Malacanang Palace. Evans flagship departed Manila on 13 March 1904. The Kentucky coaled at Hong Kong and Colombo. Sailing through the Suez Canal into the Mediterranean Sea to the port of Naples, Italy. The voyage continued to Gibraltar coaling at Madeira; the flagship Kentucky arrived at the New York Navy Yard, 23 May 1904. Admiral Evans hauled down his flag, 27 May 1904 from battleship, Kentucky. 31 March 1905, a 13 gun salute was fired by battleship, USS Maine (BB-10) at Pensacola, Florida as the flag of Rear Admiral Robley D. Evans, Commander-in-Chief of the North Atlantic Fleet was broken at the main mast. 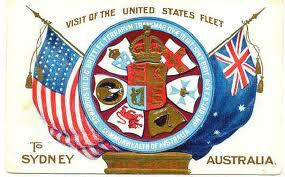 The fleet sailed on 7 May 1905 for Hampton Roads, Virginia. Admiral Evans returned to his Alma Mater the United States Naval Academy at Annapolis, Maryland on 30 October 1905. The British Fleet under command of His Serene Highness, Prince Louis of Battenberg arrived at Annapolis. 1 November 1905, the Prince visited Evans on Maine. Admiral Evans gave Prince Louis, a tour of the Naval Academy and battleship Maine. A reception by Evans was held later in the week on battleship, Maine for Governor Edwin Warfield of Maryland. Admiral Evans in flagship, Maine sailed on 7 November 1905 from Annapolis to New York. Admiral Evans stayed onboard Maine during repairs from 20 November 1905 to January 1906. After winter quarters in Guantanamo Bay, Cuba on 3 May 1906 Evans returned the fleet to New York. 2 September 1906 Maine anchored next to the presidential yacht, USS Mayflower (PY-1) off Oyster Bay, Long Island. President Theodore Roosevelt came on board Maine to confer with Evans. Admiral Evans in flagship Maine departed New York, December 28 for winter quarters in Cuban waters. 15 April 1907 Evans flagship, Maine returned to Hampton Roads. 16 April 1907 Evans hauled down his flag on Maine and then hoisted it on the battleship, USS Connecticut (BB-18), flagship for the World Cruise. The USS Connecticut was Rear Admiral Rodley D. Evan’s Flagship, part of the First Division, of the Great White Fleet. 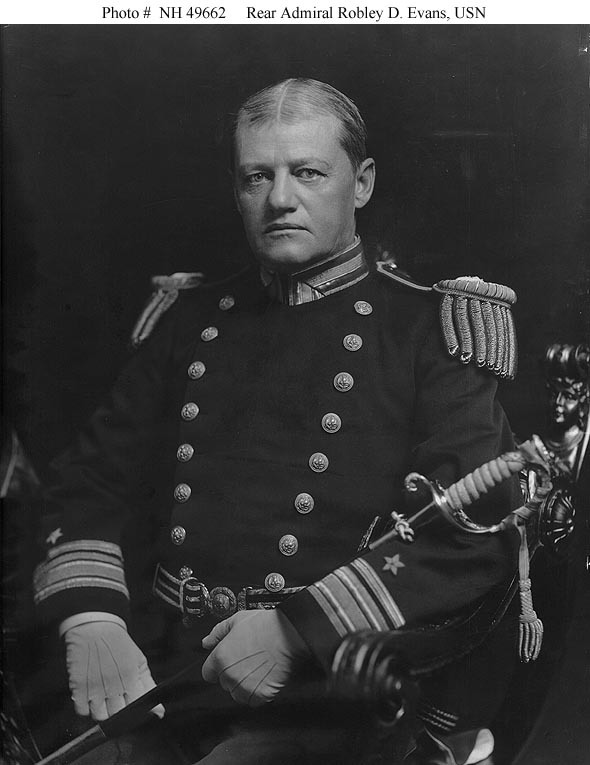 Rear Admiral Robley D. Evans commanded President Theodore Roosevelt’s “Great White Fleet” of sixteen battleships on the first leg of its long world cruise. The fleet left Hampton Roads, Virginia on December 16, 1907, and after cruising around South America, passing through the Strait of Magellan, and visiting many countries along the way, the fleet, arrived in San Francisco Bay on May 6, 1908. The cruise was not a good experience for Evans. He had spent most of his time in bed with his pain and illness. In San Francisco, an enfeebled Evans relinquished his command to Rear Admiral Charles Mitchell Thomas. However, Thomas being in ill health was replaced five days later by Rear Admiral Charles Stillman Sperry. The “Great White Fleet” then continued its triumphant cruise, stopping at ports in countries all around the world, and verifying that the United States was indeed a world naval power. Having circled the world, the fleet returned to Hampton Roads on February 22, 1909. 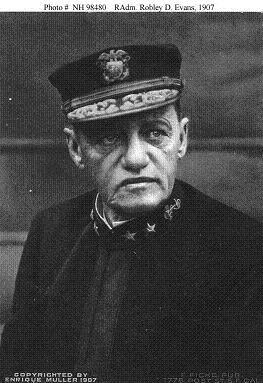 Rear Admiral Evans commanded the Great White Fleet 16 April 1907 from Hampton Roads, Virginia in its passage from the Atlantic Ocean through the Straits of Magellan to the Pacific Ocean, where he was relieved of command Rear Admiral R.D. Evans in San Francisco, California 9 May 1908 because of ill health. He died in Washington, D.C. on 3 January 1912. Rear Admiral Evans was entitled to the Civil War Campaign Medal, Sampson Medal and Spanish Campaign Medal. Two destroyers, USS Evans (DD-78), launched 30 October 1918, and USS Evans (DD-552),launched 4 October 1942, were named in his honor. Theodore Roosevelt owned a guinea pig named Fighting Bob Evans. 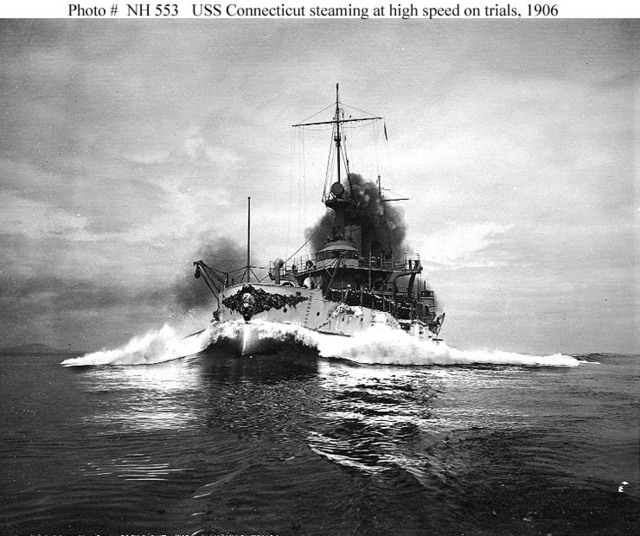 The Great White Fleet, USS Connecticut leads the way (1907). 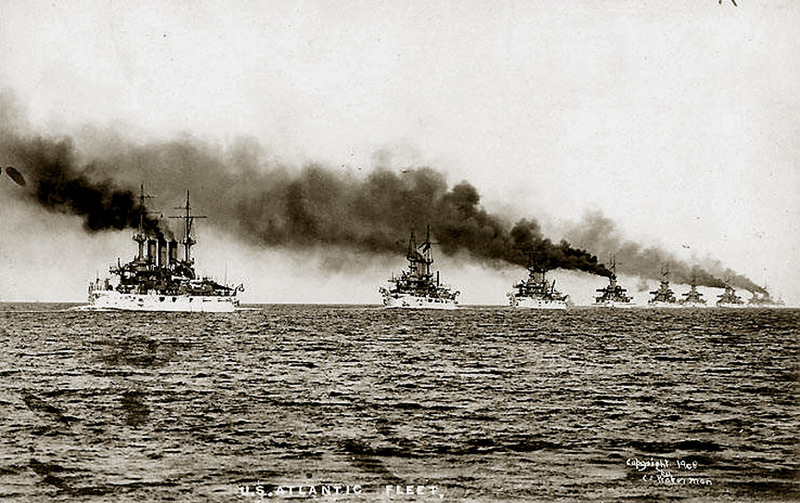 Distant view of the Great White Fleet. Harbor Scene – Look at all that air pollution. USS Prairie State – Naval Residence Midshipmen Training School at New York 1940s – 1950s (FKA: USS Illinois). The Fleet, First Squadron and First Division, were commanded by Rear Admiral Robley D. Evans. The USS Connecticut was his flagship. Click on this link for more information on Rear Admiral Robley D. Evans. The heroic actions of Pvt Henry Wasmuth saved the life of Ensign Robley D. Evans, at the cost of Pvt Henry Wasmuth’s life, in the era of the American Civil War, during the second battle at Fort Fisher. 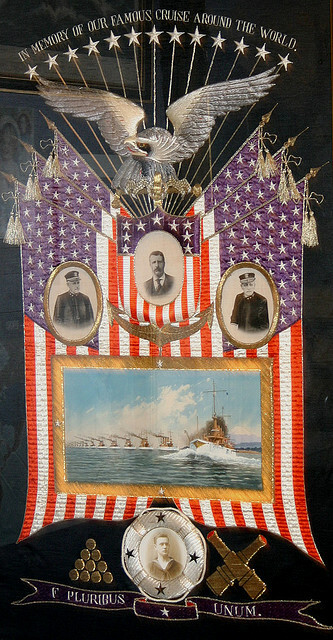 There are lots of post cards listed for auction on eBay, that pertain to the “Great White Fleet”. You are currently browsing the Griffyclan007's Blog blog archives for May, 2011.